Replace legacy learning management system with a robust, cost-effective LMS that better engages customers. Streamline the process of developing and delivering the training content. Redesign HTML5-based Help to align with the clean, modern look-and-feel of the Fred IT Group corporate website. Enhance the user experience by making it easier to navigate training and Help content to find the information they need. Efficiency: Flare’s topic-based single-source publishing simplify the creation and management of the Learning Pathways LMS. Easy Customization: Templates enable Fred IT Group to easily customize the look and feel and maintain the brand consistency of the Learning Pathways and online Help. Improved User Experience: Top navigation and integrated multimedia support provide an interactive web experience and make it easier for users to navigate the content. As the business grew, and its product line evolved, the company recognized that it was no longer a scalable or cost-effective approach to train all content face to face. This realization led Fred to offer online training via a hosted learning management system, Fred Academy, as part of a blended solution. Over time, the company ran into several challenges with the learning management system (LMS) software. Fred began seeking alternatives to its existing LMS software. And the team quickly realized that they already had a powerful tool in place with MadCap Flare, which they had been using since 2014 to produce the Online Help for Fred NXT, an internal knowledge base called FredWise, as well as smaller online Help systems for various other products. “Based on the success we had with using Flare for our online Help, we saw that it would be an effective tool to help us achieve our goal of creating a more robust, cost-effective and engaging learning solution,” said Sophie Lissonnet, technical writer and information management specialist at Fred. Using MadCap Flare, Fred now delivers a revamped, more dynamic learning experience for its users. 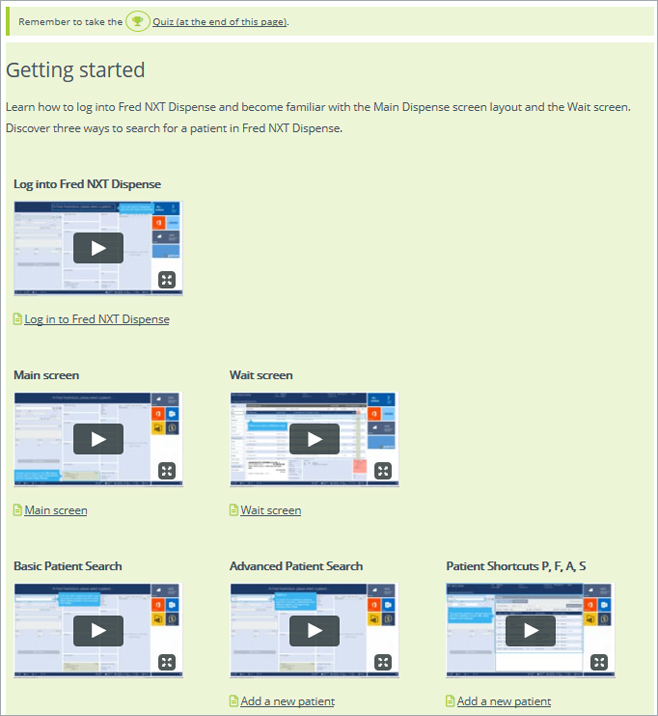 The Learning Pathways training section, which is part of the Fred NXT Online Help, no longer requires login credentials to complete training for the Fred NXT platform. Instead, users select their specific roles to access relevant, embedded short videos. From there, users can take an optional quiz in order to receive a certificate of completion. Behind the scenes, Learning Pathways also creates a ticket on one of Fred’s ConnectWise boards, which facilitates monitoring and reporting. 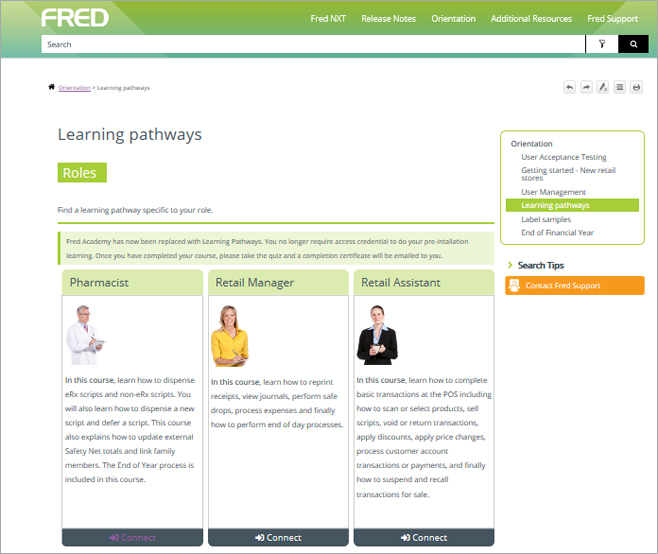 Users can select roles in Fred’s Learning Pathways for relevant content. The new Learning Pathways section also features a more holistic approach to engaging users, focusing less on ensuring that every person completes the quizzes and more on providing them the flexibility to consume content however they want, on any device, at any time in the flow of work. 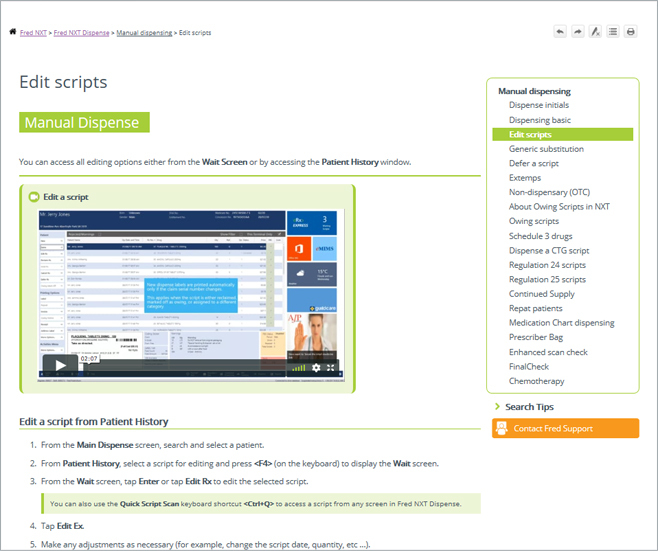 Also contributing to the improved web experience of Learning Pathways is the use of multimedia support and top navigation in MadCap Flare. Recently, the Fred team has leveraged the ability to configure additional menu skin components with MadCap Flare, enabling them to place the search bar and side menus wherever they desire. Meanwhile, the team utilizes MadCap Flare’s ability to quickly add videos created with various tools to provide a more interactive and visual learning experience for customers. “We had 30 videos that needed to be updated, and once I did so, I could easily upload them back into Flare with very little change,” Nackovska recalled. Additionally, Fred takes advantage of MadCap Flare’s topic-based single-source publishing to streamline the development and delivery of its Learning Pathways and Help content. “Being able to create and publish from a single, centralized source of content with Flare has allowed us to maintain and update content much faster to keep pace with product releases,” explains Lissonnet. To enhance the quality of the online Help and training content, Fred uses the MadCap Analyzer functionality integrated into MadCap Flare. Project analysis in Flare allows users to go through the company’s Flare-based documentation to help find issues, such as broken hyperlinks. Because Fred uses MadCap Flare to produce both its online help and Learning Pathways, the team has been able to standardize, review, and publish all training and Help content in a single system. Additionally, Fred uses MadCap Flare to publish a large internal knowledge base, FredWise, which is used primarily by Fred’s customer support and technical team members. 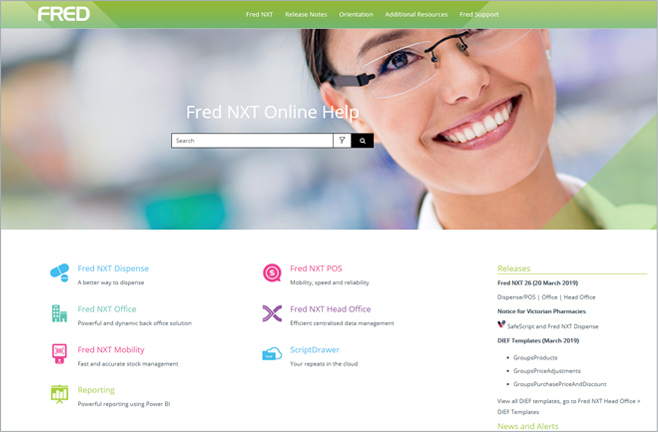 In addition to creating Learning Pathways, the company continues to enhance the look of its online Help for Fred NXT. Most recently, with the release of new out-of-the-box templates in MadCap Flare, the team saw an opportunity to redesign the home page of its responsive HTML5-based Help website to look modern and attractive. The current online Help was built with a combination of the Balboa and Cardiff templates, enabling the team to customize the look and feel to be aligned with the company’s corporate site and branding. The current design incorporates a static display on the right side of the site home page, as found on the Cardiff template, solving the challenge of finding a place for occasional announcements, such as new releases and user alerts. This side section replaces a ribbon-like slideshow running across the home page that users found difficult to follow.